Ever wanted to attend a classical music performance at the historic Carnegie Hall? 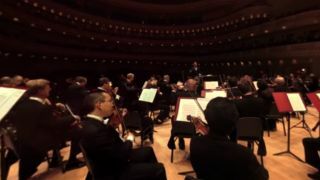 Even if you could secure the travel fare to Manhattan as well as a seat in the century-old concert hall, you may not get as good a view as this 360-degree video, which puts you right next to the musicians as they play. Uploaded to Carnegie Hall's YouTube account, this performance of "In the Hall of the Mountain King" grants watchers the ability to look freely around the orchestra with the drag of a mouse, nod of a headset, or tilt of a smartphone. The video also supports 4K resolution for those wanting to read the music notes over the bassoonist's shoulder in ultra high def. The video is a result of Carnegie's partnership with the Google Cultural Institute, an online collection of exhibits, displays, and even tours curated and conducted using Google technologies. Several other performances are available in 360-degree viewing, such as a speech from Henry V courtesy of the Royal Shakespeare Company. Those wanting an additional layer of immersion can also play these videos using Google Cardboard, thanks to YouTube's recent addition of virtual reality support. Finally, all the class of a night out at the theater without all that uncomfortable formal wear! If the works of Edvard Grieg or William Shakespeare aren't your jam, classics aren't the only productions to go the 360-degree route. Recently, Disney on Broadway uploaded an interactive version of the famous opening number from The Lion King, choreographed puppetry and all. Will the Oculus Rift deliver real-life immersive experiences?